Dental exams are much like regular medical exams and physicals – both are preventive measures to help you stay healthy. Oral health has been found to be connected to overall health: periodontal gum disease has been linked to diabetes; pregnancy has been linked to tooth loss; while stress may cause TMJ, dry mouth syndrome and other dental problems.Getting a regular dental exam and cleaning from your dentist is the best way to prevent oral diseases and further dental costs. A dental exam for children is usually recommended once your child has 4 teeth in his mouth. Your child be be taught how to brush and floss properly reinforcing that dental care and oral hygiene as a valuable part of your child’s life. Dental exams include examination of diagnostic x-rays to help detect tooth decay, tumors, cysts, and bone loss. Dental x-rays can also determine tooth and root position. 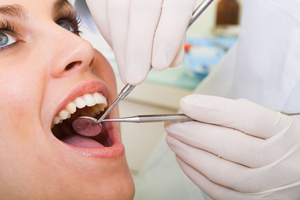 A professional teeth cleaning involves having accumulated plaque removed from your teeth. To help harden your teeth and prevent cavities, your dentist may apply flouride. Don’t wait to feel pain in your mouth before going to the dentist for a check-up. Meet with a trusted dentist regularly to enjoy a healthy and beautiful smile always.